Copyright © 2013 Basilio Vagner Ramírez, Viviana Castaño Palacio. This is an open access article distributed under the Creative Commons Attribution License, which permits unrestricted use, distribution, and reproduction in any medium, provided the original work is properly cited. Proportional to the growth rate of its clinical expression, the last decades have seen an increase on JC Virus diagnosis testing, and on therapeutic and symptoms management plans. Whether isolated or associated to retroviral therapy, the relationship of JC Virus to HIV allowed us to delve a little deeper into the knowledge of its behavior. Now as new immunemodulating and immune-suppressing therapies are developed, its clinical expression has become broader and more complexly, thereby our need is to develop more precise diagnosis and therapeutic plans. Worldwide JC virus seroprevalence is 70% - 90% . It is found in nature and 14 subtypes which can be isolated by specific geographic areas . The virus infects children asymptomatically ; it remains on renal tissue and can be eliminated in urine in 40% - 75% of individuals around the age of 30 [4,5]. Its coexistence with humans without much variation through centuries has made it a useful tool for geographic migration studies . This virus, without much variation, was isolated for the first time in 1971 on the brain of a Hodgkin lymphoma patient . It is found associated to multiple diseases like medulloblastoma [8,9], multiform glioblastoma  and, Progressive Multifocal Leucoencephalopathy, an entity whose prevalence has increased during recent years and was first described by Åstrom in 1958 . The JC virus or John Cunningham virus (JCV) is a polyomavirus with a circular double chain DNA 5 kB genome, its capsid contains three viral proteins VP1, VP2 and VP3, with VP1 being the most abundant . With a regulating protein (Agnoprotein) Progressive Multifocal Leucoencephalopathy (PML) pathogenesis is divided into 3 stages: during the first stage the virus behaves as a subclinical infection; during the second stage it remains latent in the genitourinary tract, bone marrow, tonsils, lung, spleen and gastrointestinal tissue [13-17] and during the third stage it presents viral reactivation and dissemination towards the central nervous system. During the second stage, the virus remains latent with a nonpathologic DNA regulatory region (RR) between codifying proteins, called archetype. Genetic material transcription takes place at the two DNA strands. The early region codifies the regulating proteins along with T protein and its variants (T135, T163 and T165). The latter region codifies the capsid proteins and the Agnoprotein . Early genes are responsible for large T and small t antigen codification, and for the transformation, genetic regulation and replication. They codify counterclockwise while nonregulatory region or late genes codify clockwise. Agnoprotein is a polypeptide which acts as cell proliferation and growth suppressor enabling second stage cell cycle deregulation. The Agnoprotein interacts with T protein to inhibit DNA replication . The infectious cycle starts when JC Virus protein particles bind (SA) sialic acid related Alpha 2 - 6 cell receptors, and 5HT2A serotonin receptors . Virions enter by way of clathrinmediated endocytosis . Later, by way of a still unclear mechanism, viral DNA is transported to the nucleus. Following early viral genome expression, the viral transcription undergoes a series of changes before being carried to the cytoplasm for translation. The big T antigens, small t antigens and T proteins (T135, T163 y T165) “Figure 1”, are produced after early region transcription translation . Figure 1. Viral protein synthesis. Late transcription translation generates the Agnoprotein and the 3-capsid proteins, and then nucleus encapsidation begins. . The JC Virus is activated under different immunocompromised conditions and starts a demyelination process associated to oligodendroglial cells damage, a place where it multiplies and from where it subsequently emerges . • Classic progressive multifocal and inflammatory Leucoencephalopathy(cPML-iPML) . • Progressive multifocal Leucoencephalopathy associated to immune reconstitution syndrome (PML-IRIS) [27,28]. • Progressive Multifocal Leucoencephalopathy associated to monoclonal antibodies (natalizumab, efalizumab, rituximab) [29-31]. • Virus C related cerebellar granular cells neuropathy (JCVGCN) . • JC virus related Encephalopathy (JCVE) . The diagnosis of the different JC Virus related manifesttations are based on common elements. PCR JCV sensitivity has decreased progressively after the antiretroviral therapy was developed and it is now deemed to be 58% . Brain biopsy with pathological analysis has 64% - 96% sensitivity and 100% specificity . Among the most outstanding PLM findings we have oligodendrocytes with extended nuclei, chromatin loss, and intranuclear accumulation of homogeneous basophile dyeing material. Astrocyte morphology changes with mult-lobe hyperchromatic nuclei similar to neoplasic cells called “Bizarre” astrocytes. Other characteristics are the absence of—or mild—inflammation . The JC virus Neuronopathy of cerebellar granular cells (JCVGCN) describes cerebellar peduncles, bridge and cerebellar hemisphere as the expression of JC Virus without the characteristic findings on oligodendrocyte and astrocyte cells . Neuropathy due to JC virus infection of the cerebellar granular cells (JCVGCN) is characterized by involvement of cerebellar peduncles, pons and cerebellar hemispheres as JCV expression without characteristic findings in oligodendrocytes and astrocytes . Encephalopathy associated to JCV (JCVE) is characterized by lysis of the cortical pyramidal neurons, astrocytes and laminar necrosis. The findings might extend to the gray matter, without the typical demyelinating lesions . A variant of the classic PML is pattern PLM or predominant inflammatory PML (iPML) of similar behavior but with a focal or diffuse predominant inflammatory component a perivascular mononuclear infiltrate, and CD3 cellular predominance . In most cases big T antigen and VP1 capsid protein may be detected through immunohistochemistry on PML patients’ brain tissue biopsies . Currently image studies play a fundamental role on the diagnosis of the disease, considering resonance as its main representative . There is predominant compromise of the cerebral white matter at different locations. (Supratentorial, infratentorial, medulla), [43,44], compromising somehow the gray matter, sometimes unusual locations such as the corpus callosum may also be involved . It is characterized by classic hyperintense T2 and Flair and hyperintense T1 images, and isointense less frequently, may affect any area of the brain, usually the parietal lobe followed by the frontal lobe. On MRI the classic lesions are characterized by being hiperintense on T2 and Flair imaging, hyperintense on T1 imaging and less frequently isointense. The lesions can affect any area of the brain, mainly the parietal lobe followed by the frontal lobe and the posterior fosse involving cerebellar hemispheres and peduncles. Lesions on the medulla are unusual . Lesions tend to be asymmetrical, confluent and bilateral. The gray matter is involved especially at the thalamus and at basal ganglia . Other techniques may also be used including magnetization by transfer  and spectroscopy . In general Symptoms tend to vary in relation to the location of the lesions; hemianopsia is one of the most frequent symptoms and it is present in 40% of cases. The patient might also have progressive decrease in muscular strength along with hemiparesis, ataxia and walking difficulties. Cognitive deterioration is present in progressive manner and may lead to dementia . Seizures may occur during the course of the disease or might be the first manifestation of disease . Several therapeutic regimes have been used to treat PLM and HIV patients with poor results up to now. Some of them involve application of mefloquine , cidofovir , mirtazapine , topotecan (topoisomerase inhibitor), interferon alpha  and citrabine . One study with 4 types of antiretroviral medications, including enfuvirtide, suggested a possible increase in survival . Approximately half of patients with HIV and PML survive after the initiation of antiretroviral therapy. However, the previous neurological deficiency may remain . Plasma Exchange and immune absorption have been used on a PLM nonHIV patient . In general, JCV symptomatic neurological expressions tend to increase progressively, not only on account of a larger number of cases involving HIV patients but due to the development of new therapeutic schemes focused on managing diverse pathologies that may affect in different ways the activity of the immune system. 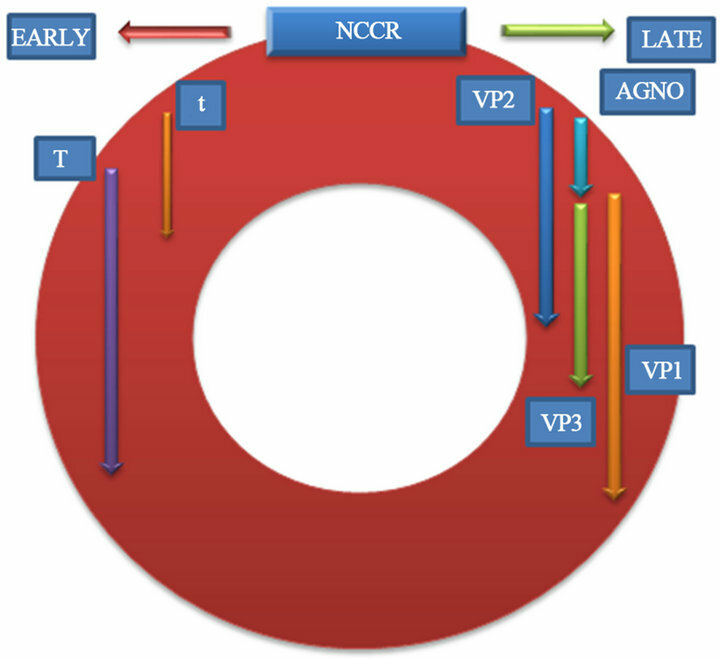 The growing knowledge on JC Virus neural immune behavior patterns enable development of new diagnostic and therapeutic schemes focused on the early stages of the disease, even before related to clinical manifestations appear, taking into account the great current therapeutic limitations, especially PML cases in conjunction with HIV. Agostini, H.T., Ryschkewitsch, C.F. and Stoner, G.L. (1996) Genotype profile of human polyomavirus JC excreted in urine of immunocompetent individuals. Journal of Clinical Microbiology, 34, 159-164. Åström, K.E., Mancall, E.L. and Richardson, E.P. (1958) Progressive multifocal leukoencephalopathy: A hitherto unrecognized complication of chronic lymphatic leukaemia and Hodgkin’s disease. Brain, 81, 93-111. Elsner, C. and Dörries, K. (1998) Human polyomavirus JC control region variants in persistently infected CNS and kidney tissue. Journal of General Virology, l79, 789- 799. Frisque, R.J., Bream, G.L. and Cannella, M.T. (1984) Human polyomavirus JC virus genome. Journal of Virology, 51, 458-469. Chang, D., Fung, C.Y., et al. (1997) Self-assembly of the JC virus major capsid protein, VP1, expressed in insect cells. Journal of General Virology, 78, 1435-1439. Edeling, M.A., Smith, C. and Owen, D. (2007) Life of a clathrin coat: Insights from clathrin and AP structures. Nature Reviews. Molecular Cell Biology, 7, 32-44. Johnson, R.T. and Major, E.O. (2004) Infectious demyelinating diseases. In: Lazzarini, R., Ed., Myelin Biology and Disorders, Vol. 2. Elsevier Academic Press, Waltham, 953-983. Cinque, P., Bossolasco, A.S., Brambilla, A.M., et al. (2003) The effect of highly active antiretroviral therapyinduced immune reconstitution on development and outcome of progressive multifocal leukoencephalopathy: Study of 43 cases with review of the literature. Journal for Neurovirology, 9, 1-8. Sarrazin, J.L., Soulié, D., Derosier, C., Lescop, J., Schill, H. and Cordoliani, Y.S. (1995) MRI aspects of progresssive multifocal leukoencephalopathy. Journal of Neuroradiology, 22, 172-179. Trotot, P.M., Vazeux, R., Yamashita, H.K., et al. (1990) MRI pattern of progressive multifocal leukoencephalopathy (PML) in AIDS: Pathological correlations. Journal of Neuroradiology, 17, 233-254. Arvik, J.G., Lenkinski, R.E., Grossman, R.I., et al. (1993) Proton MR spectroscopy of HIV infected patients: Characterization of abnormalities with imaging and clinical correlation. Radiology, 186, 739-744. Gasnault, J., Hendel Chavez, E., et al. (2007) Acceleration of immune recovery on intensified ART improves survival in patients with AIDS-related PML: Preliminary reports of the ANRS 125 Trial. 14th Conference on Retroviruses and Opportunistic Illnesses, Los Angeles.